The Open Championship waits for no man, even the defending champion and world number one. The 144th edition of golf’s oldest major tees off on July 16 without Rory McIlroy, who withdrew after severely injuring his ankle in a July 4 soccer game with friends. Fans of the Northern Irishman now turn their eyes to Aug. 13 and the opening round of the PGA Championship, where McIlroy is again the defending champion. But will he be fit to make the trip to defend at Whistling Straits in Wisconsin? The 26-year-old said he suffered a “total rupture” of his left anterior talofibular ligament (ATFL), located in the outer section of the ankle. Cohen said that only an MRI would show the extent of the injury. McIlroy was scheduled to have more scans earlier this week. He is rehabbing under the care of English sports scientist Dr. Steven McGregor. He is the defending champion at the WGC-Bridgestone in Akron, Ohio, Aug. 6-9, a week before the PGA Championship. Two weeks after the season’s final major, the FedEx Cup playoffs begin, with four tournaments in a five-week stretch beginning Aug. 27. That line-up would have seen McIlroy play six tournaments in eight weeks, a heavy schedule even if he were fully fit. If McIlroy is unable to defend his titles at the WGC and PGA Championship next month, he may be wary of returning to face an intense playoff schedule, meaning we may have seen the last of him for this PGA Tour season. In his message to fans, McIlroy said only that he hopes to be back as soon as he can. That could be later, rather than sooner. 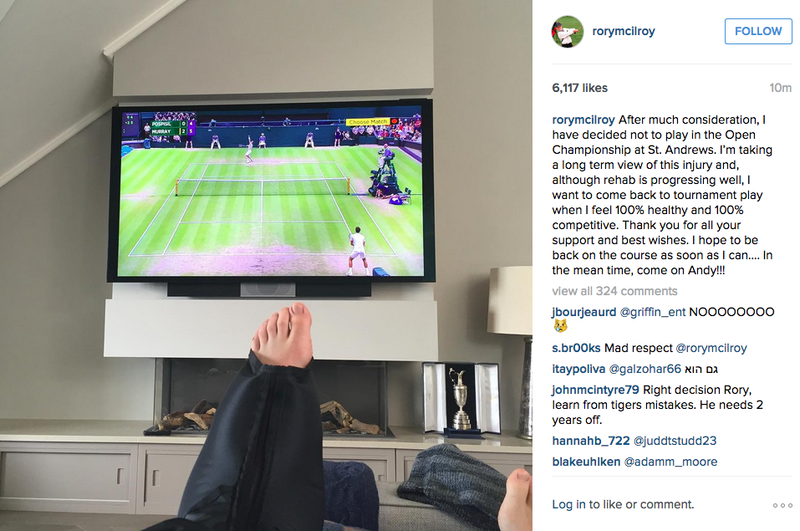 McIlroy posted an Instagram photo letting the world know he would not be at this year’s British Open.